National and international guidelines recommend supportive approaches to AKI management, but organizational strategies to improve delivery of AKI care have not previously been tested in multicenter randomized studies. The authors describe a pragmatic, multicenter, cluster randomized trial across five United Kingdom hospitals of an intervention comprising an AKI detection and e-alert system, an AKI care bundle, and an educational program for health care workers. Although the intervention did not alter the primary outcome of 30-day mortality, it was associated with reductions in length of hospital stay as well as an increase in AKI incidence that likely reflected improved recognition. These results combined with previous evidence show that strategies to improve the systematic delivery of supportive AKI care can lead to improvements in patient outcomes. Background Variable standards of care may contribute to poor outcomes associated with AKI. We evaluated whether a multifaceted intervention (AKI e-alerts, an AKI care bundle, and an education program) would improve delivery of care and patient outcomes at an organizational level. Methods A multicenter, pragmatic, stepped-wedge cluster randomized trial was performed in five UK hospitals, involving patients with AKI aged ≥18 years. The intervention was introduced sequentially across fixed three-month periods according to a randomly determined schedule until all hospitals were exposed. The primary outcome was 30-day mortality, with pre-specified secondary endpoints and a nested evaluation of care process delivery. The nature of the intervention precluded blinding, but data collection and analysis were independent of project delivery teams. Results We studied 24,059 AKI episodes, finding an overall 30-day mortality of 24.5%, with no difference between control and intervention periods. Hospital length of stay was reduced with the intervention (decreases of 0.7, 1.1, and 1.3 days at the 0.5, 0.6, and 0.7 quantiles, respectively). AKI incidence increased and was mirrored by an increase in the proportion of patients with a coded diagnosis of AKI. Our assessment of process measures in 1048 patients showed improvements in several metrics including AKI recognition, medication optimization, and fluid assessment. 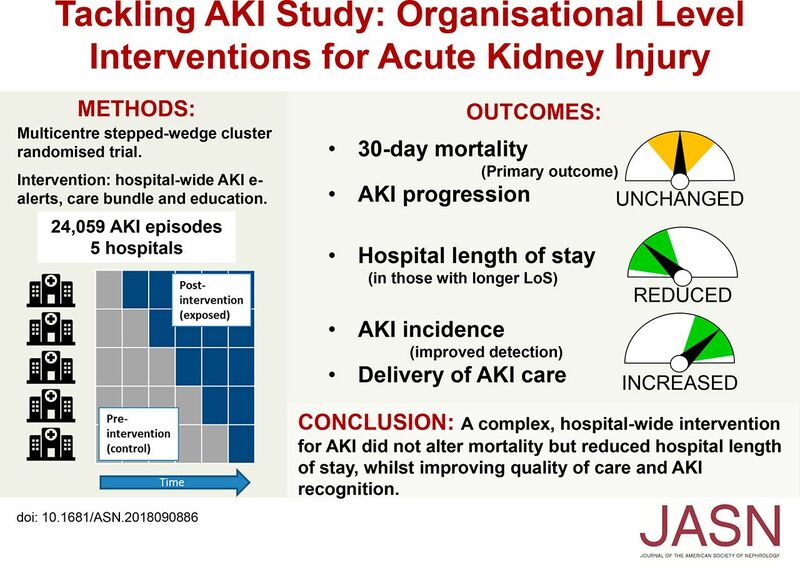 Conclusions A complex, hospital-wide intervention to reduce harm associated with AKI did not reduce 30-day AKI mortality but did result in reductions in hospital length of stay, accompanied by improvements in in quality of care. An increase in AKI incidence likely reflected improved recognition.